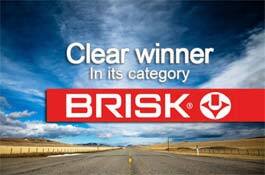 From the year 1994 the company BRISK Tábor a.s. is a holder of the certificate ČSN EN ISO 9001. In the year 1998 the company was certified according to German standard DIN EN ISO 9001 supplemented by requirements of automotive industry VDA 6.1 and American Standard QS-9000. Through this the company met basic requirements of automotive industry. The implemented Quality Management System is motivating the continuous improvement process of all company's activities. The aim is to enhance their effectiveness for better satisfaction of customer's needs. In the year 2003 the company implemented the Procedural Control System and is certified according to standard ISO/TS 16949:2002 "Specific demands for supplies to OEM of automotive industry". The company is continuing to monitor the developments in the area of quality and in the branch of automotive industry and it is ready to develop and improve the implemented quality systems. One of the demands in the area of quality it was the transformation to procedural company's control accompanying internal assessment enhancement within the frame of company. Together with already traditional aspects of quality systems the procedural control brought several useful elements. Simplification and straightening of informational and procedural flows, improvement of evaluation of internal activities and others were some of them. The transformation to procedural control brought the necessity of new sight of the company and its organizational structure accompanying changes of established procedures and activities. Effectively, transparency and flexibility of implemented quality system is proving capability of continuous offer of product which fulfils customer's requirements. In the year 2008 the company initiated the process of integrated quality and environmental control which was finished with Integrated Recertification Audit in October 2009 according to international standards ISO/TS 16949:2009 and ISO 14001:2004. The recertification audit was carried out by external certification company DEKRA Certification. For following period of time the integrated quality and environmental policy and concurrent quality and environmental targets were determined in order that at implementation of Self Assessment Elements the Jopint Stock Company would master the preparation for Total Quality and Environmental System Management and within the frame of Supervisory Audit in the year 2009 the company would be recertified according to amended standard ISO/TS 16949:2009 of automotive industry.